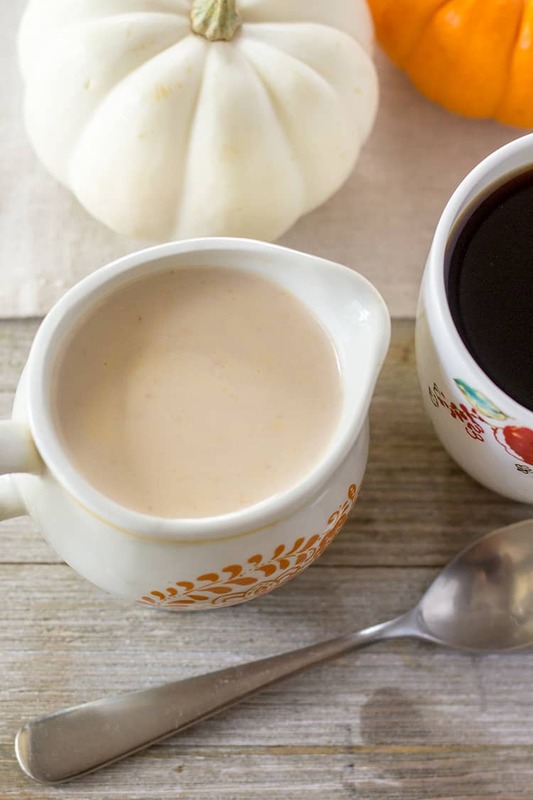 This Pumpkin Spice Coffee Creamer is as delicious as store-bought creamer, but with natural ingredients. It’s surprisingly easy to make. Best of all, you can customize the sweetness level, or even make it sugar-free, to fit your own tastes! Why not use store bought creamer? Store-bought pumpkin spice coffee creamer tastes great, but the list of ingredients gives me pause. Water and sugar top the list, followed by vegetable oil and a list of artificial ingredients. Where’s the actual cream in the creamer? It states that it “Contains 2% or less of: Sodium Caseinate: A Milk Derivative”, which I guess is as close as it gets. 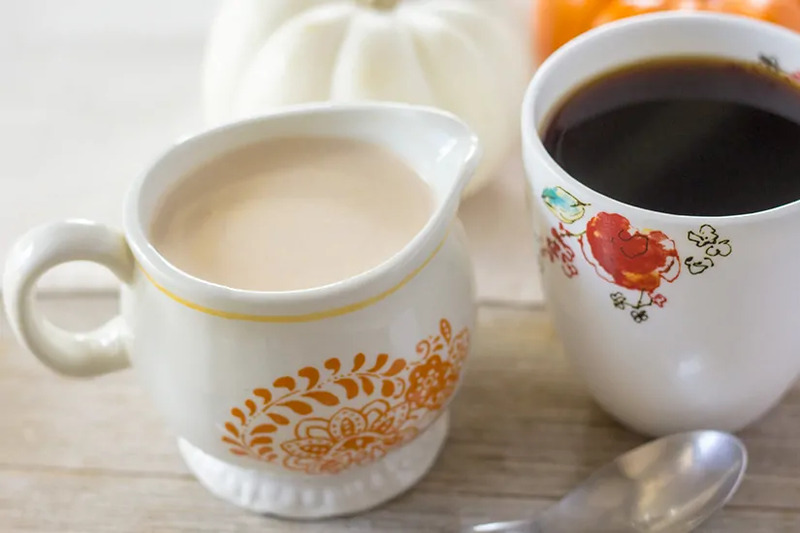 And, once I realized how easy it is to make your own pumpkin spice coffee creamer, especially if you use an Instant Pot, I knew I’d never go back to store-bought. You’ll find instructions on how to make this creamer in both the Instant Pot and on the stove top. I personally prefer the Instant Pot method. It’s faster and the milk seems to heat more evenly in the Instant Pot. Both methods will yield very similar results, though the milk didn’t reduce quite as much when I made the stove-top version. Can I Make This Sugar-Free? Yes, this recipe can easily be made sugar-free. Simply leave the sugar out. When the creamer is finished you can either add your favorite sugar-free sweetener to the entire container of creamer, or leave the creamer unsweetened. And instead, add the desired amount of sugar-free sweetener directly to your coffee cup when you add the pumpkin spice creamer. 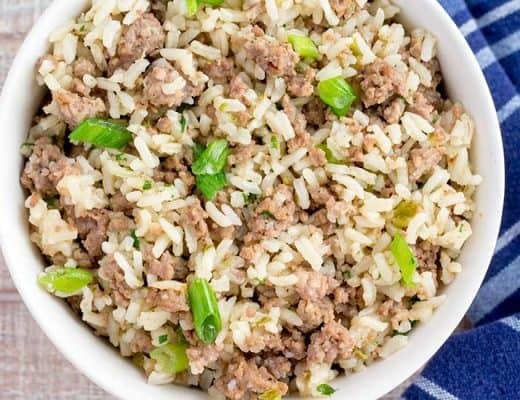 Add sugar to Instant Pot. Then add milk, giving it a whisk to combine. Press Sauté, making sure it’s set to Normal. Then, set a timer for 15 minutes. 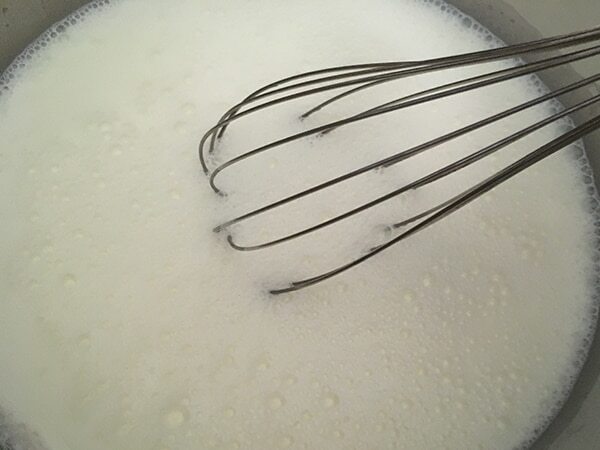 Whisk often as sugar begins to dissolve and milk mixture begins to heat. 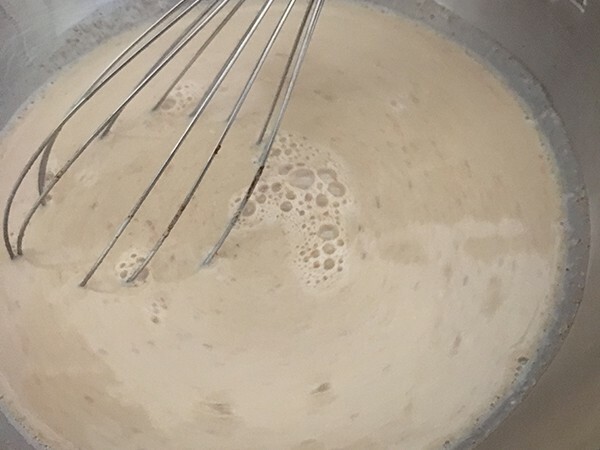 Once milk begins to simmer, stop whisking. The milk will rapidly simmer. Allow to do so undisturbed for the remainder of the 15 minutes. When timer sounds, the milk mixture should look something like this. 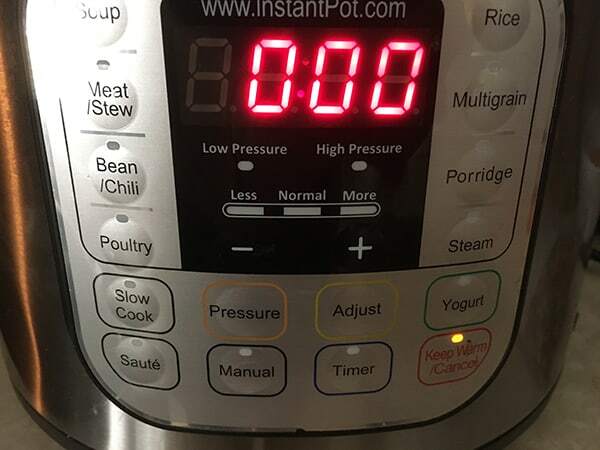 Immediately remove inner pot from the Instant Pot (careful, it will be hot). 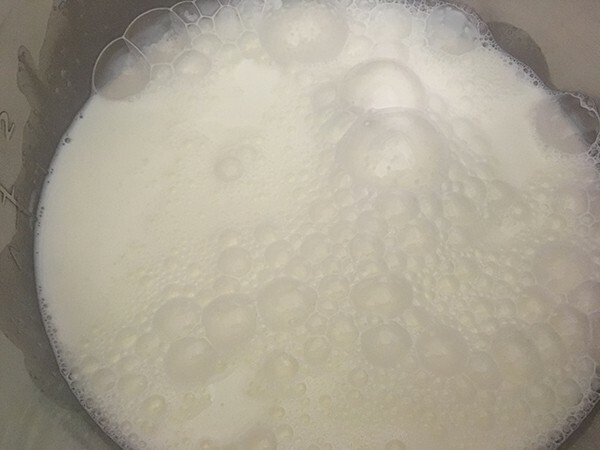 Skim off and discard any foam on top (there may be none), then pour milk mixture into a large bowl. 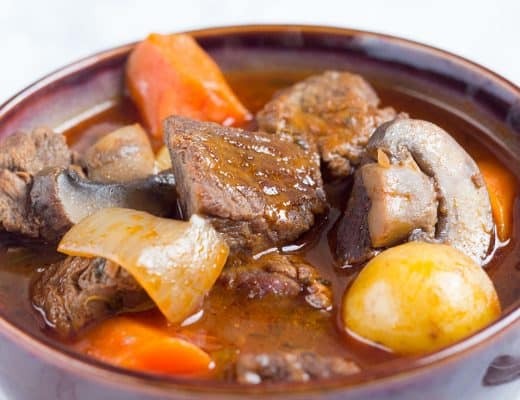 Quickly wash out inner pot, dry and return it back into the Instant Pot. Set to “Keep Warm”. 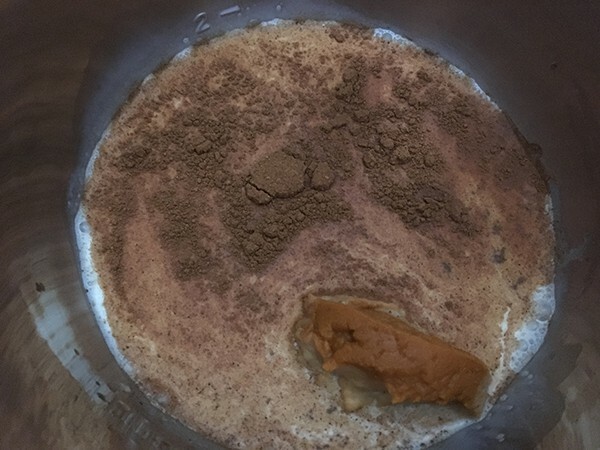 Add remaining cup of milk, pumpkin, vanilla and pumpkin pie spice to Instant Pot. Whisk, then heat for 2 to 5 minutes, until milk is heated through and the mixture is well combined. Place a fine mesh strainer, or use a colander lined in cheesecloth, over the bowl containing the sugar and milk mixture. Then, pour the pumpkin mixture through the strainer. This will remove some of the pumpkin and pumpkin spice sediment. This step is optional. Whisk pumpkin mixture and milk mixture together in bowl, then pour into air tight container, such as a quart size mason jar. It will make roughly 3/4 quarts, or 3 cups. Store in refrigerator and shake well before using. 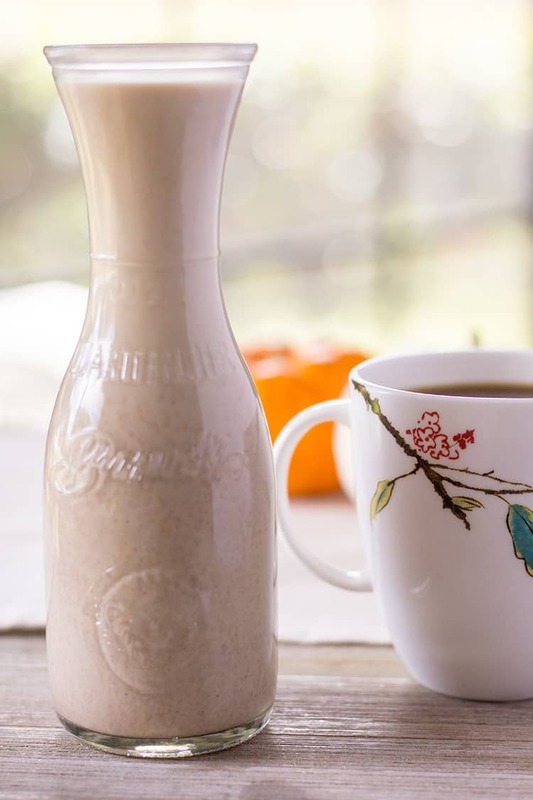 ★ Did you make this Pumpkin Spice Coffee Creamer? 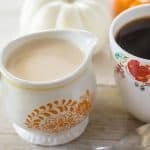 Skip the artificial ingredients in store-bought creamer with this homemade Pumpkin Spice Coffee Creamer, made in the Instant Pot! Stove top instructions also included. Combine 1 cup of sugar and 3 cups of milk in Instant Pot. 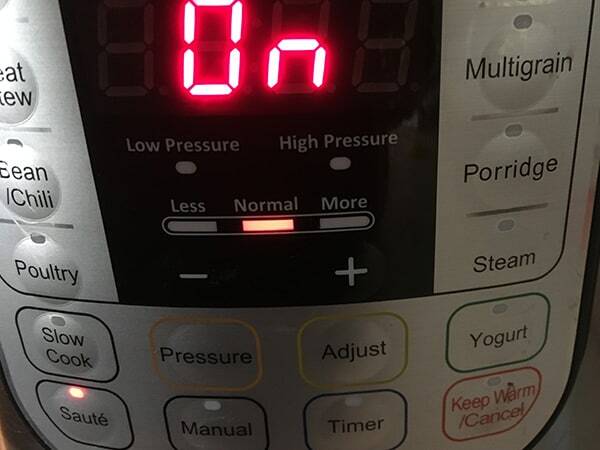 Turn on sauté feature, set to "normal". Sauté for 15 minutes, whisking occasionally as the milk warms and sugar dissolves. 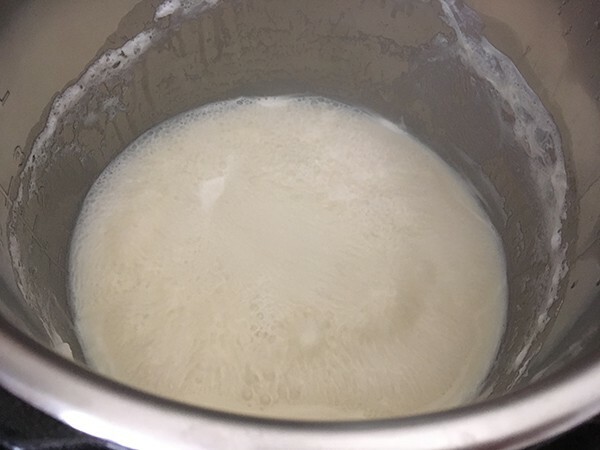 Once milk begins to simmer, stop stirring and allow to continue to rapidly simmer undisturbed for remainder of the 15 minutes. Carefully remove inner pot from Instant Pot. 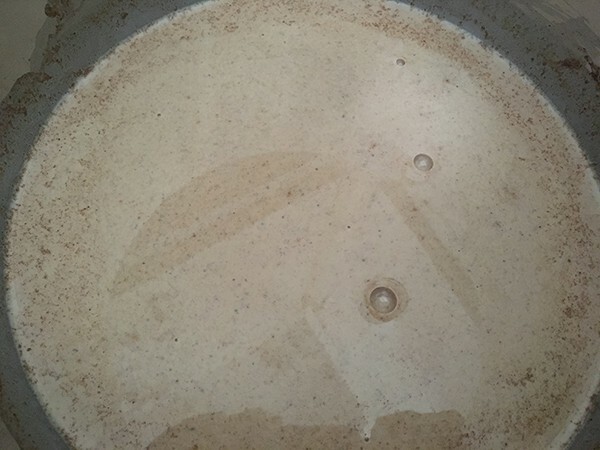 Skim off and discard any foam (there may be none), and pour milk/sugar mixture into a large bowl to cool. 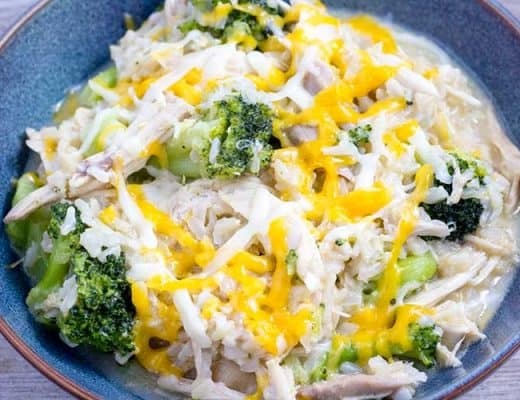 Wash pot, dry, and return to Instant Pot. Add remaining cup of milk, pumpkin, vanilla, and pumpkin pie spice to pot and turn on Keep Warm setting. Place a fine mesh strainer, or use a colander lined in cheesecloth, over the bowl containing the sugar/milk mixture. 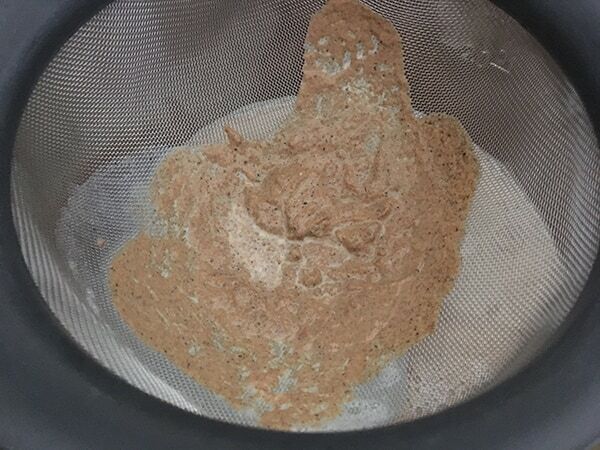 Then, pour the pumpkin mixture through the strainer to remove some of the pumpkin and pumpkin spice sediment (optional step). Whisk to combine milk mixture and pumpkin mixture. Store in an air tight container, such as a quart sized mason jar, in the fridge. Combine 1 cup of sugar and 3 cups of milk in a sauce pan over medium low heat, whisking often until milk is warm and sugar is dissolved. 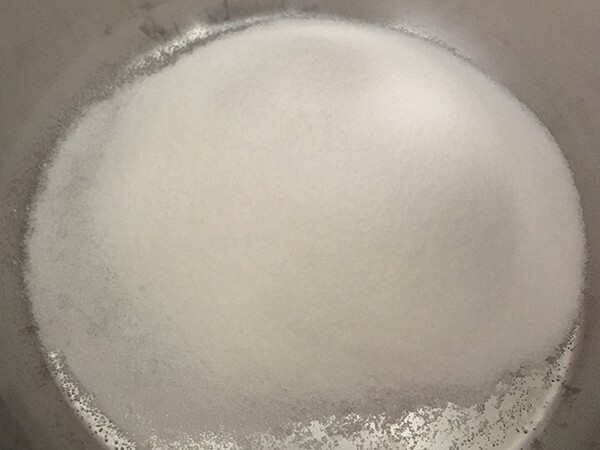 Once sugar is dissolved, bring to rapid simmer over medium heat. Once milk begins to simmer, stop whisking and allow to simmer for 20 to 30 minutes (until reduced to 2 cups) undisturbed. Remove from heat. Skim off any foam that has accumulated on the top and discard. Then, pour milk and sugar mixture into a large bowl. In a small saucepan, combine remaining cup of milk, pumpkin puree, vanilla extract and pumpkin pie spice over medium low heat, whisking occasionally. Heat pumpkin mixture until warmed through, then pour through a fine mesh strainer to remove some of the pumpkin and spice sediment (optional step) and combine with milk and sugar mixture. Store in an air tight container, such as a quart sized mason jar, in the fridge. This creamer is very sweet as is, but if you prefer a sweeter creamer, add maple syrup to the finished product until desired level of sweetness is achieved. Makes approximately 3/4 quarts, though may make more or less depending on how much the sugar and milk mixture reduces while cooking. To make sugar-free creamer, simply leave the sugar out and follow all other instructions. Then, add sugar-free sweetener of choice to finished product.